Happy Halloween! Celebrate with your little ghosts and ghouls by using this fun activity pack! 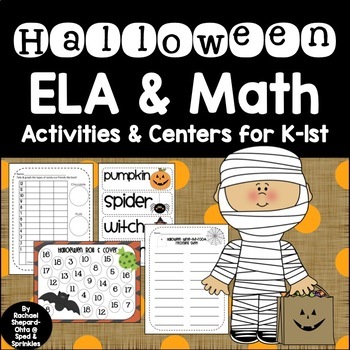 There are enough activities to last you the entire week of Halloween- and the activities are differentiated for you! 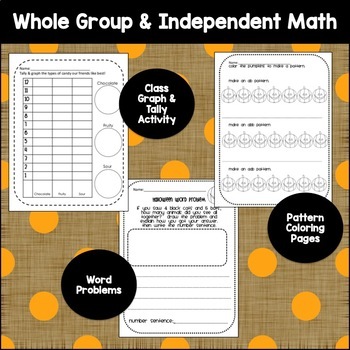 Each item in this pack can be used as individual, partner, group, or whole-class work. 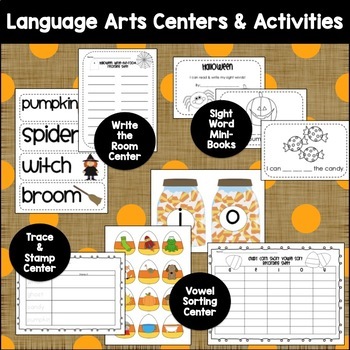 Each center activity comes with a directions sheet for your convenience. 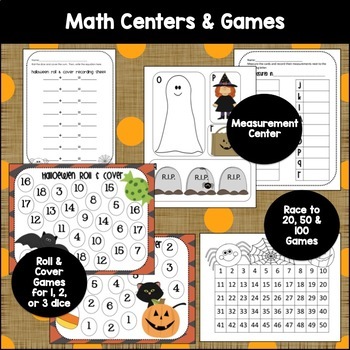 All you need to supplement this entire pack are pencils, crayons, dice, cubes, links, or other measuring tool, clipboards, and candy corn or other candy or object to use as a marker for games. Enjoy! CCSS.Math.Content.1.MD.A.2 Express the length of an object as a whole number of length units, by laying multiple copies of a shorter object (the length unit) end to end; understand that the length measurement of an object is the number of same-size length units that span it with no gaps or overlaps. Limit to contexts where the object being measured is spanned by a whole number of length units with no gaps or overlaps. CCSS.Math.Content.1.MD.C.4 Organize, represent, and interpret data with up to three categories; ask and answer questions about the total number of data points, how many in each category, and how many more or less are in one category than in another. CCSS.ELA-Literacy.RF.1.2b Orally produce single-syllable words by blending sounds (phonemes), including consonant blends.